New Delhi: “Amity Society for Nuclear Security” under the aegis of Amity Institute of Nuclear Science & Technology (AINST) was inaugurated by Dr. Ashok K Chauhan, Founder President- Amity Education Group; Prof. R. Rajaraman, Professor Emeritus, School of Physical Sciences, Jawaharlal Nehru University; Air Marshal Vinod Patney, DG, Centre for Air Power Studies (CAPS); Dr. W Selvamurthy, President, Amity Science Technology and Innovation Foundation and Dr. Alpana Goel, Director AINST, today at University campus, Sector 125, Noida. 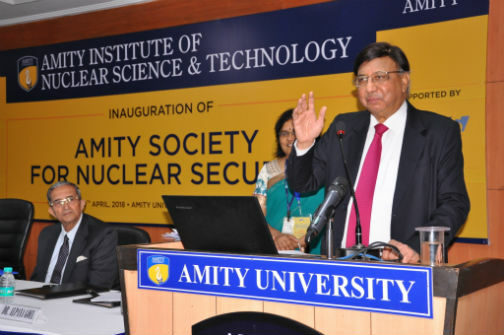 Amity Society for Nuclear Security aims to provide a common platform for Academicians, Scholars and Experts dealing with Nuclear Science and Technology in India. The society intend to focus on the challenges, strategies and reforms in providing access to Nuclear Security of Material/ Facility for Teaching and Research. Addressing the gathering, Dr. Ashok K Chauhan said that nuclear energy plays an increasingly important role in India’s energy security and sustainable development plans. He emphasized that understanding of nuclear security in terms of technical, policy, and regulatory aspects is very important for achieving and maintaining e a high level of safety and security at nuclear facilities, worldwide. Dr. Chauhan called upon the scientists to provide valuable suggestions towards reforming the security of nuclear energy. Talking about “Role of Civil Society in Nuclear Security” Prof. R. Rajaraman, Professor Emeritus, School of Physical Sciences, Jawaharlal Nehru University said that there have been anti-nuclear protests stressing the dangers of radioactivity on people and the environment. After Fukushima reactor explosion, the protests were re-energized empowered. Prof. Rajaraman shared that officials from Department of Atomic Energy have researched that villagers who live in areas adjoining the nuclear plants do not seem to have suffered statistically significant increase of cancer or genetic damage. He emphasized the offices of scientists and other employees wouldn’t had been located inside or around the nuclear plants, if these had posed hazard to health. He averred that nuclear energy if not the only source of non-carbon based energy available to fill the gap of electricity generation. Severable renewable resources like wind and solar energy units exist but are not persuaded seriously. Though, the present government is now strongly supporting the growth of solar energy. He stressed that Government and social activists must educate people about nuclear hazards pro-actively but in a responsible and balanced manner. There is a need to address the public perception and fears in the matter, he opined. Sharing his views, Dr. R. K. Singh, DAE Raja Ramanna Fellow, Ex-Head, Reactor Safety Division, BARC, Mumbai said that there are multiple challenges with all types of reactor systems. He stressed that need of the hour is to have a systematic research and development which is backed up by experimental program followed with analytic evaluations. Speaking on the occasion, Air Marshal Vinod Patney, DG, Centre for Air Power Studies (CAPS) said that there are various ways to enhance the nuclear security. He outlined that long term re-precautions need to be taken and surveys should be conducted to assess the number of people who doesn’t have much knowledge or have misapprehensions regarding nuclear energy. Air Marshal Patney pointed out that there are specified rules and patterns for nuclear security which must be reviewed.